A riveting novel from first page to last, "Jennifer's Plan" by Don Meyer is the story of Jennifer Cerriety and Harold Seaweather, two people who find themselves caught up in desperate struggle for survival and its aftermath in a harrowing encounter with Big Jim Colbert and his boys. Even having survived her ordeal, there may be no justice — unless Jennifer calls in the only man she knows who might be able to do something about what's happened. Original, superbly crafted, replete with memorable characters and even more memorable events, "Jennifer's Plan" is a masterpiece of narrative storytelling and a highly recommended addition to community library collections and supplemental reading lists. “I enjoyed this as a good read… Good Story, many great characters and a neat, out of the box ending to the story." 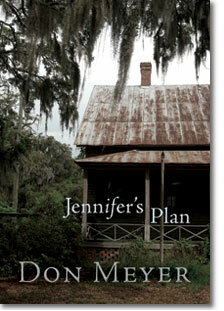 If you like tales with a different premise for the plot, you'll enjoy Jennifer's Plan. A law student's passage through a small town takes her through another kind of passage with her only hope to stay alive is by using her wits. Jennifer Cerriety gets into big trouble when she gets lost on her way to Harpers Crossing. Thought to be someone who is there to cause trouble for the locals, a group of men decide to teach her a lesson at one of their meetings. She is kidnapped from her car and thrown into the company of a black boy also taken captive by these men. Soon it becomes obvious that whatever they have planned for Jennifer will include this boy, Harold Seaweather. Talented author Don Meyer gives the reader a look into the baser type of personalities in a small town and those with decency and kindness as the story unwinds. Will Jennifer and Harold survive the night? Will they seek revenge on their tormenters? How? Who are these men and what is the purpose of their meetings? Realistic characters bring the story alive and you'll like them or dislike them as you read. Through this very able writer's description, you'll feel as if you've visited this small town and met the inhabitants. This is a tale that could have been taken from the newspapers. Recommended to any reader of thrillers or stories of the darker side of human nature and what they're capable of. You'll come away with a fuller understanding of evil.